The project was to create a graphic brand and messaging environment to propel all aspects of a 35 million dollar fundraising campaign to build a new high school. When we were hired, all they had in place was a logo, which would remain intact. The challenge was to build an environment around the logo which would be contemporary and clean, without being spartan or stuffy. 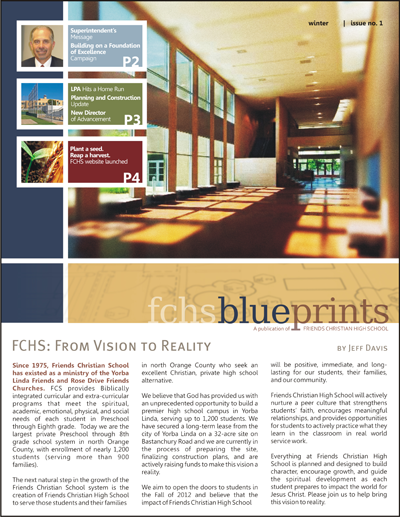 Additionally, the branded look and the website would be adopted as the High School’s once they were open for business. Before launching into design, we conceived a hook–“plant a seed. reap a harvest”–which we would use as a graphic anchor and tag line during the fundraising phase, and then shed the message once fundraising was complete. To date, the project has included theme concept, copy writing, website and newsletter creation, donor prospectus, and various banners and printed promotional pieces. The look is exactly what they were after, and the project is yielding a robust (8 figure) influx of donated funds.